Earlier I wrote about Wii MotionPlus which will prove as a great controller for sure and now here it is one more surprise for you-yes this time it is’nt any add-on but is a concept indeed! 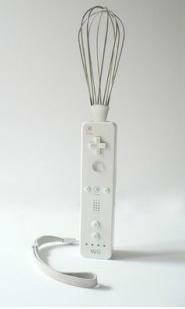 Yeah it’s Wiimote for kitchen which is more versatile than you expect indeed. This modified version is able to help you out with your kitchen chores, and I would presume the whisk add-on you see here can be replaced with other items. Hopefully this is some special waterproof Wiimote as kitchens tend to get messy and dirty during meal preparation, requiring you to clean up with plenty of water. What better could you have asked for than this one?